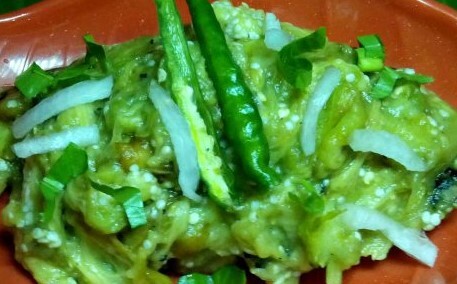 Bengena Pitika ( Mashed brinjal ) is one of the popular recipes in Assam. In Assamese, Bengena means Brinjal and Pitika means Chutney you can also call Brinjal Chutney. Bengena Pitika recipe is so popular because of its tasty and very easy preparing. in this post I will tell you how to prepare Bengena Pitika. One Big Size Brinjal ( 200 Gm ). Two Medium Size Onion (Chopped ). Green Chilli (Chopped) - 2 Pice. Coriander Leaves ( Chopped) - 2 tsp. Preparing Method: Put the brinjal on direct fire for roasting. take out Roasted brinjal from the fire. Place the brinjal in a bowl of water (so that the skin comes out easily while peeling). Peel off and take out the pulp. Take a bowl and mix all ingredients - chopped onion, chopped green chilly, mustard oil, coriander leaves, and salt. now your Bengena Pitika is ready. Serve with hot rice. Also, read - Gahori Manxor logor Lai Xaak.